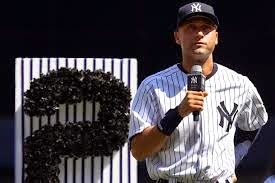 Yesterday a special ceremony was held for retiring Yankees shortstop, Derek Jeter. September 7, 2014 was "Derek Jeter day." Many of Jeter's former teammates came to pay homage to this great baseball player. Among them were, Jorge Posada, Tino Martinez, Bernie Williams, Joe Torre, Andy Pettitte, David Cone, Paul o'Neil and so forth. Derek Jeter started his career with the Yankees in 1995. He won five World Series with the team and numerous other awards for his skills on the field. Jeter has participated in many All-Star games and has been the "face of baseball" since he was a rookie. At the ceremony, he received many gifts, plagues and even a paid vacation to Tuscany, Italy. His family were in attendance and at the end, he gave a short but powerful speech thanking everyone, especially the fans who have watched him grow up and who he said he has watch some "get old" as well. Derek Jeter will not doubt be inducted into the Baseball Hall of Fame. He has earned his place there with his many achievements, professionalism and gentleman personality. He is a class act! Not once did he even get into a brawl or argued with an umpire. He replied to these with big hits or his famous "Jeterian" hits that seems to send the ball towards the opposite way from where he swung the bat towards. Moreover, he reaching 3,000 hits in a dramatic way by doing it with a home-run! These are things only the "Babe" was able to do which made him a legend. Jeter is the New York Yankees modern "Babe Ruth" and he will be truly missed. I was a mere kid when he started and have followed his career since. You know you made it big as a Yankee when even the Red Sox fans and other teams cheer you and celebrate your career. The Yankees will not be the same without him.